Residents constructing or erecting an accessory building on their property within the Red River Planning District are required to obtain a permit. In obtaining a permit, details of the construction and location of the accessory building must be identified. An accessory building 120 sq. 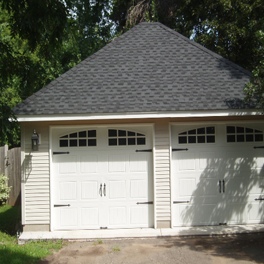 ft. or less (outside surface measurement) does not require a building permit (except in the Village of Dunnottar where a permit is required for any accessory building in excess of 100 sq. ft. and except in the R.M. of East St. Paul where a permit is required for any accessory building in excess of 107.64 sq. ft.). All structures MUST comply with the minimum yard requirements of the respective Municipal Zoning By-Law. To find out your setback requirements, please contact the RRPD office with your property's Tax Roll Number, and the municipality or city in which your property is located. Our office can then determine your property's zoning and provide you with the required setback information. This information will let the property owner know how far they need to be away from both their property lines and other structures on the property. Accessory structures that are 3 stories or less in height and less than 600 m2 in area.